Home > Non Invasive Tests > What is an Exercise Test? Why do I Need an Exercise Test? If your GP or heart specialist suspects that you may have a problem with the workings of your heart they may request that you take part in an exercise tolerance test. This test is used as a diagnostic tool for determining the presence of cardiac conditions such as coronary artery disease. It may also be used to find out if any procedure undertaken, such as heart surgery, has been effective and has improved the hearts overall function. It can be used to find out if fitness levels are linked to heart function, to determine a safe level of exercise that can be undertaken by the individual or to see how well the heart adjusts to additional pressures put upon it. Initially the person will have the procedure explained to them as they must understand and co-operate with the physician to achieve a satisfactory and true result.The person will then be attached to a variety of machines such as those that monitor heart rate, rhythm and blood pressure, often with the addition of breathing apparatus to check lung function and capability. A baseline monitoring will be recorded so there is something on which to compare the results. The individual will then be asked to take part in some form of exercise, usually involving the use of a treadmill. The equipment will usually begin slowly, increasing in difficulty and/or speed as the physician sees fit. Often, the person will be required to breathe into specialist equipment at regular intervals to find out how the lungs are functioning and managing the extra stress. After the doctor has achieved the degree of stress required, the test will stop and the individual will be asked to have their breathing and cardiac functions tested again.The doctor will then compare results of the monitoring, which will contribute to making an accurate diagnosis, or necessitate the ordering of further tests if needed. It should be noted that the person will be able to stop the test at any time if they are feeling unwell or are finding it too difficult. In general an exercise test will aim to measure how the body reacts and copes with additional stress put upon it. During the test blood pressure, pulse rate, oxygen levels and respiration rate will be monitored and measured against how the body functions when at rest and free from stress. The body and heart in particular is forced to work harder when put under pressure from increased mobility and exercise, the doctor will examine the results and find out if the heart is responding as expected during this time, and will hopefully be able to find out which part of the heart is not functioning properly. 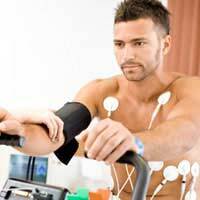 Exercise tolerance tests are routinely used to measure the overall effectiveness of the heart. They should not be painful and should only be uncomfortable as far as being attached to monitors and undertaking physical activity cause. They are very useful in helping the physician determine any problems with the heart and can help provide a more accurate diagnosis.